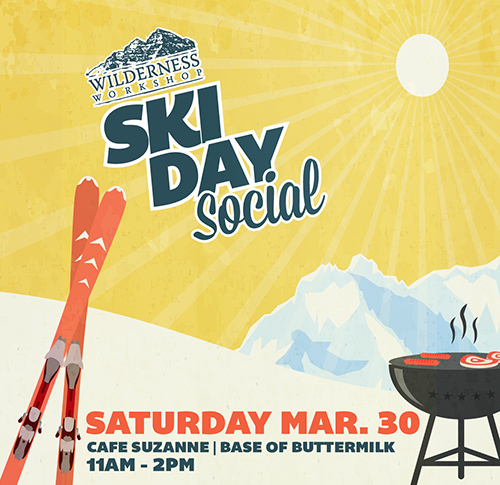 Wilderness Workshop is holding a fun event this Saturday at the base of West Buttermilk - the Ski Day Social. The Social takes place from 11 am to 2 pm at the old Cafe Suzanne, and will include free burgers and brews. It's a delightful way to celebrate the important work that Wilderness Workshop does to protect public lands, and get some runs in at Buttermilk before they close next weekend. Members can receive a special 50% discounted lift ticket. If you're not a current member, consider renewing or joining Wilderness Workshop - after you know more about what they do, consider volunteering. RSVP here. And, we're expecting to have some fresh snow that day too. It's a win-win!